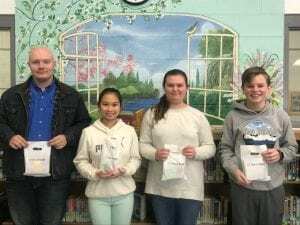 Fannin County Middle School 8th grade teams have announced Students of the Month for December. Students are chosen by their academic teachers for this distinction. Qualifications for this honor include outstanding citizenship, good attendance, respectfulness toward faculty and peers, and a good academic standing. Students chosen for December are: Gracie Stewart, daughter of Darrell & Mitzi Stewart of Epworth; Konner Brown, son of Kiley & Jana Brown of Blue Ridge; Quyen Hoang, daughter of Luong & Phuong Hoang of Mineral Bluff; and Craig Wilcher, son of Adam Wilcher of Blue Ridge and Laura Wilcher of Blairsville. « Previous Article $1,000,000 in savings. Public Works cuts budget and raises productivity.